After India became independent in 1947, there used to be a serious shortage of food grains and cereals all over the country, right through the first or 1950's decade. The Government was forced to continue rationing of food grains, which had started earlier in WW II years, because of the serious food grain shortages in the general markets. The situation used to be quite bad with rampant black marketing of food grains. The basic reason of the shortages obviously was that India was not growing enough food grains in the country, needed to feed the entire population. The common man had no choice but to buy whatever was offered in the rationing shops by the Government. The grains like rice and wheat, that were available for sale in these shops, used to be of extremely poor quality. Since none of us had any real choice, we just ate whatever was available. 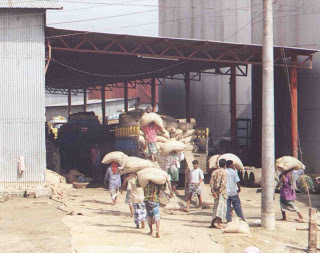 The supply side situation was equally bad and the Government machinery found it tough to procure requisite quantities of food grain required to feed the population. The Government also did not have enough foreign exchange in the kitty to buy food grains from international markets. Pressed into such a tight situation, Government asked US Government for help. In 1954 US President Eisenhower signed a law known as PL-480, or Public Law 480. It was also known as "Food for Peace" law because it provided a funding avenue for the US Government by which US food could be used for overseas aid. With this law in place, United States agreed to supply to India, wheat under PL 480 programme, free or at zero cost. The ships carrying PL480 wheat would carry it in holds without any packing and used to be unloaded by sucking out or pouring it through big pipes on the ports. That reddish coloured wheat used to be very inferior grade wheat or Milo, as it was called then and was mostly used to feed farm animals back in US. However India had absolutely no other option and distributed same Milo through ration shops. Since Indians were fully aware that ' Beggars can’t be choosers' and consumed the wheat available in ration shops. Today in India, we consume super grade wheat like 'Sihore' or 'Lokawan' and today's young generation of India, would not even be able to imagine the quality of wheat that we all ate in those days, leave alone the idea of actually eating it. Whatever may be the quality, it was still food for the masses. Arrival of a PL-480 ship was always headline news. PL-480 made the difference between food riots and dinner for everyone. Since the PL-480 wheat or Milo was originally meant to be the farm feed, it used to be unsorted and uncleaned. There used to be quite a few foreign articles like small stones in it and it needed through sorting before use. The PL-480 ships unloaded the grains on the docks through giant pipes or ducts, like iron ore or similar mineral, and would be repacked on the docks in gunnysacks for further distribution. Along with the grain, PL 480 ships also brought to India another seed, which created a havoc in India for next two or three decades. 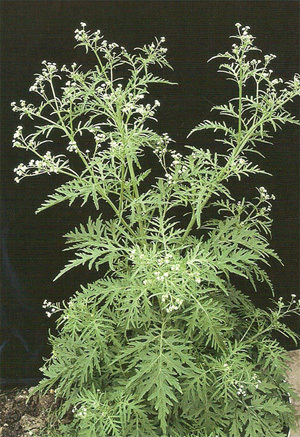 This seed was a grass seed known as Parthenium and originally was found in Americas. It however found Indian continent very hospitable and grew by leaps and bounds. It became known popularly as “ Congress” or “Gajar” grass and spread everywhere with equal speed and fury. India's fields, meadows, vast expanses of barren lands and even garbage dumps were soon found to be covered with Parthenium grass. This grass was a killer and it slowly eliminated the local grasses. Parthenium grass and it's lovely little white flowers, were found by many people highly allergic. Rashes over the body, asthma and watery eyes were observed to be common symptoms. 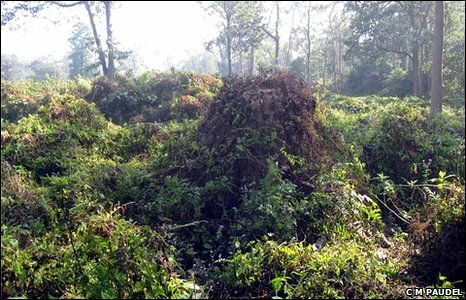 As the Parthenium menace grew, number of projects had to be taken across the country to find a suitable method of elimination. After continuous research by many agricultural scientists and organizations, India was able to control to a great extent this unwanted guest. I am reminded of this Parthenium menace because of the arrival of a similar unwanted guest in Nepal. Chitwan national park is Nepal's most popular national park. This is the first national park in Nepal, established in 1973 and was granted the status of a World Heritage Site in 1984. It covers an area of 932 Sq. Km. in the subtropical Inner Terai lowlands of south-central Nepal. This park is a natural habitat of animals like Tigers, Leopards and is considered as Nepal's sole habitat for Rhinoceros. Few years back an unwelcome weed or creeper from Brazil known as Mikenia Micrantha was first observed in this park. It is just not known how this plant arrived in Nepal. However like Parthenium in India, Mikenia Micrantha has found Chitwan national park very hospitable for it and has been growing like mad there. Almost 20% of the total area of this park is now covered by this weed. In the regions, which are normal habitats for Rhinoceros, almost 50% area is not under Mikenia Micrantha cover. Mikenia Micrantha is sometimes called as “Mile a minute” weed indicating its high speed of growth. It can occupy entire countryside within a short time. All grasses, sgrubs as well as large trees get equally covered under its net like growth. This growth prevents any sunlight falling on the vegetation or trees under it and eventually they just die out. Animals like deer, which feed on the grasses, naturally move away and along with the deer, tigers and leopards, being the next link in the food chain, move away. The birds are unable to build any nests on the trees covered by Mikenia Micrantha and migrate from such areas. Mikenia Micrantha was first seen in a wild life sanctuary in east Nepal, where it has caused great damage to the environment. According to some Nepali environmentalists, this creeper was imported by British from Brazil to India to cover and hide the military camps in WW II. It is not being seen in India but has now appeared in Chitwan national park area and has created a question mark about very existence of the park itself. Nepali biologists are not willing to carry out any chemical or biological measures to control the weed because of the possible danger to Nepal's eco-system itself. Measure like physically or manually removing the weed are being tried but effectiveness of such methods is unknown. The weed is now also seen at some places in west Nepal also. 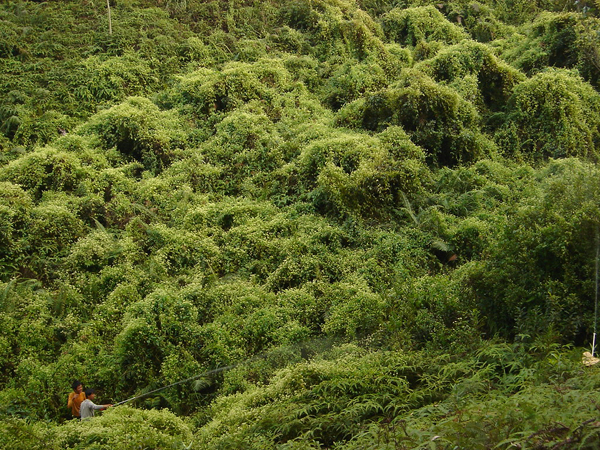 If a measure is not quickly found the foliage in Nepal could be under great danger of being suffocated under Mikenia Micrantha and eventually dying out. Just like a family, nature also seems to get unwanted guests once in a while. Perhaps, it also finds that getting rid of them is an equally daunting task! Looks like USA and Britain are not that friendly and generous. In fact, the Europeans brought a number of diseases with them to Americas. These diseases were just not there before they came to Americas. And wherever British went, they destroyed the old culture, maybe did some good things, principally for themselves, to be able to govern, and planted bad seeds, along with it. We do enjoy the good things they did in India, by way of modern western technology education, building most of the infrastructure. But we also got some 'unwanted guests'. Well, now that we are rich and learned in the modern technology, we should be able to deal with it. One good thing which the British did for India was they uprooted all the Capricious Nawabs and Maharajas. If the British were not there we certainly would be under some Nawab or Maharaja or another as the Indian population has no particular aversion to the misdeeds of the rulers. Even today they do not do much about that.